It’s hard to imagine anyone other than Al Pacino taking on the role of Sonny. There’s something organically outlandish about his mannerisms that are stamped with his own sensibilities. He tends to go over-the-top, but like Daniel Day-Lewis, he manages to make it feel very appropriate, elevating urgency to the whole picture. 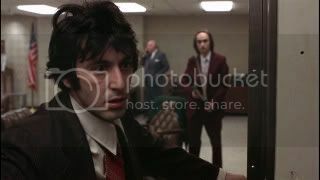 Dog Day Afternoon is effective in its writing and direction, but becomes something truly memorable because of Pacino’s presence. The film opens with a bank heist the goes wrong from the start – the bank vault doesn’t have a lot of money, one of the three robbers backs out of the plan mid-heist, etc. The worst of their problems is yet to come, as the bank is surrounded by police. Having recently watched Spike Lee’s Inside Job, I feared that I was in for another over-the-top heist film. What Inside Job tries to do is critique social class issues within the confines of its heist narrative – its criticisms fall flat given the exaggerated aspects of its plot. With Dog Day Afternoon, the subversive elements of its narrative feel genuine- everything from Lumet’s documentary style of filmmaking to the narrative revealing its lead character’s homosexuality is handled matter-of-factly. The social consciousness associated with the role of the media, the portrayal of criminals on television, and the police are surprisingly thought-provoking and given the film so much more meaning than I anticipated. Dog Day Afternoon certainly stands as one of the best films of its type, particularly amongst American heist films.